It's only been 18 months since a million Northeast Ohioans arrived on downtown Cleveland's doorstep for the city's first major pro sports championship parade in 52 years. That one beautiful day of civic pride effectively removed a stone that had been weighing on the local fandom's heart for most of a lifetime. Per the event's Facebook page, hundreds or perhaps thousands of people will encircle FirstEnergy Stadium - in expected single-digit temperatures - to acknowledge the second 0-16 campaign in NFL history. More pointedly, the parade is a hearty "get bent" to a franchise not even capable of mediocrity, led by an alleged fraudster whose first off-season decision was to keep Hue Jackson, the band leader in the team's march to 0-fer oblivion. Of course, not everyone is enamored with the idea. Cleveland sports Twitter is battering itself brown and orange over the parade's ultimate intentions, and how exactly the event will impact the city's reputation. In a January 4 column, sportswriter Ben Axelrod said the parade will resurrect Cleveland's image as a "loser sports town." "Any positive effect you think this might have on the Browns - and it won't - is mitigated by the downside of the embarrassment Cleveland will have to endure as it's perceived as a city that celebrates losing," Axelrod wrote. This idea of embarrassment - of a small group of revelers making the whole city look bad- seems to be a common sentiment among the parade's dissenters. Truth told, I was against the 2016 parade. It was just the type of empty, ambition-free trolling that raised my boring-old-man hackles. Or so I'd convinced myself. My mind changed at the confluence of the Browns' epic awfulness and the anger directed at McNeil for satirizing the organization's incompetence. Before last year's planned parade, ESPN Cleveland's Tony Rizzo ranted on air about shutting down the procession and running over parade-goers with his car. Hyperbole or not, Rizzo's tirade is emblematic of a contingent of Clevelanders who blindly support an awful franchise beyond the furthest realms of common sense. I love this team, too, but I hate what they've become, and I'm sick of hearing Joe from Twinsburg whining about the QB situation for the nth time. As Chuck Klosterman wrote in a 2013 Grantland piece on the Browns, "No other fan base is so deeply loyal and so self-consciously negative at the same time." These may be charming traits to an outsider, but for someone who lives here, it's goddamn tiresome. It's this stubbornness, this downbeat "love" for an unlovely franchise that makes me support Perfect Season Parade 2.0. 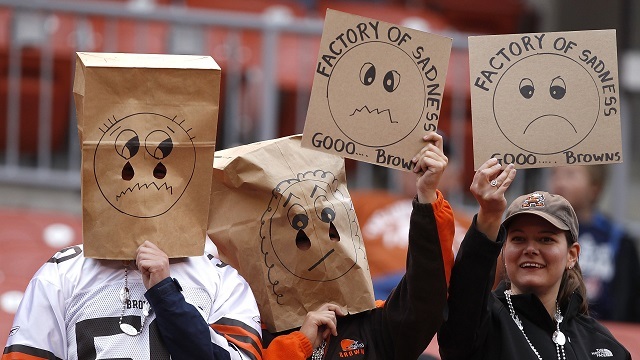 The Browns are an absurdity and are being responded to in kind. They've earned both the locally sourced derision and any national headlines the parade produces. As for "embarrassment," will a parade intended as a kiss-off reflect poorly on Cleveland? Poorly to whom, exactly? Some ambiguous national media conglomerate? Those hoity-toity elitist fans in coastal markets? Nobody seems to be able to define who "they" are, so I say forget about 'em. This isn't high school. Clevelanders should have enough self-confidence by now to not care what the cool kids think. Whether parade, protest or "celebration of failure," Saturday's procession is a way for people to blow off steam, and have a few laughs at the expense of richly deserving target. Until the Browns draft better players, keep a managerial team in place, and actually win a game, a joke parade is the only recognition they're going to get.